"In the Shadow of Giants" (2013). 32”x32”x25”. Reed, wood, rope, paper, data. Image courtesy of the artist. ​and snow data from both storms. 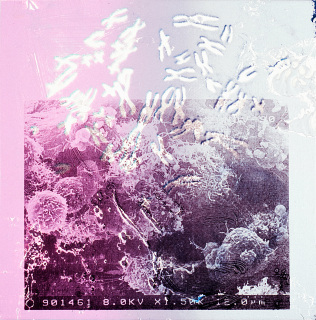 SciArt: When did you start visualizing science through art, and what sparked your interdisciplinary practice? 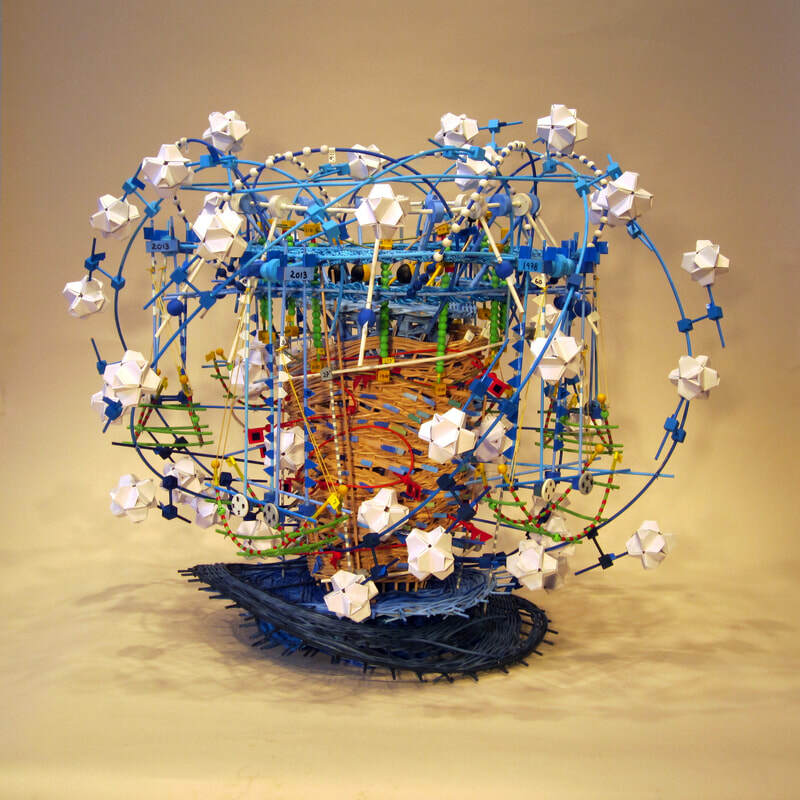 Nathalie Miebach: I began working with scientific data in 2000, when I attended astronomy classes at Harvard University and studied basket weaving with a local craft artist. Astronomy was fascinating, but frustrating. I never seemed to be able to get a real sense of the time and space dimension we talked about in class, because everything we ever looked at was on the two-dimensional plane of the projector wall. At some point, the light bulb in my head went off and I realized that I could actually use basket weaving as a three-dimensional grid through which to translate astronomical data to get a more tactile, physical sense of what I was learning about in astronomy. For my “final paper,” I turned in a sculptural translation of the Hurtzsprung-Russell diagram, which tracks the evolutionary stage of stars based on two values: their ab- solute magnitude versus surface temperature. I had a very open-minded teacher, Professor Chaisson, who was delighted and promptly invited me to show the work at a conference for science teachers. Weather came into the picture in 2006 when I had two consecutive artist residencies at the Fine Arts Work Center on Cape Cod. Zach Smith - a climate educator from the Wright Center for Science Education at Tufts University - knew of my work and approached me about a project on climate change. At the time, I knew I wanted to figure out a way for me to collect my own data to see how the sculptural translation process would change. Until then, I had relied mainly on data sources from the Internet. I was to field-test one of their instruments for the Wright Center on the beaches of Cape Cod while being tutored in how to collect science data. I knew very little about weather and only the most basic Climate Change 101 information. I soon realized that if there was any hope for me to truly understand the complexity of climate change, I had to first understand weather. For over 14 months, I went to a specific beach on Cape Cod - rain or shine - and collected weather data and observations. Rather than diving right into climate change, I decided that I would begin by studying weather and its systems. My theory was that if I could understand how weather interacts in my own backyard, then maybe I could, one day, truly understand the complex interactions of natural and man made factors that make up climate change. Detail: "In the Shadow of Giants"
"O Fortuna, Sandy Spins" (2013). 18”x18”x24”. Reed, wood, rope, bamboo, weather data. Image courtesy of the artist. 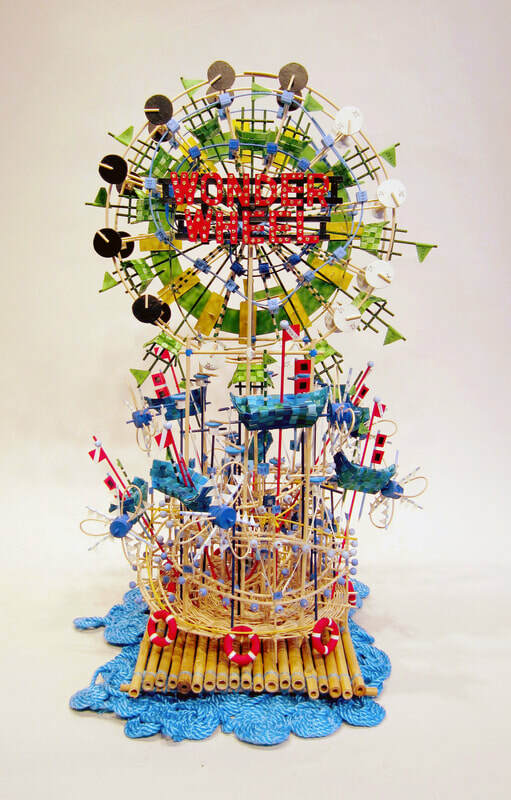 This piece takes weather and ocean data from Coney Island, NY and Seaside H eights, NJ during Oct 29, when Sandy took a ride on both the Jet Star roller coaster and Deno's Wonder Wheel. 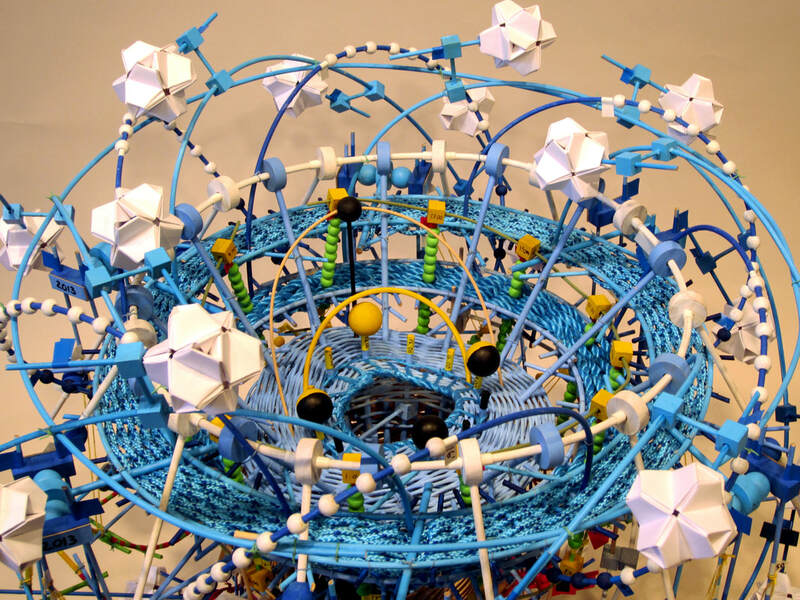 SciArt: In articulating scientific observations, what does your artistic process consist of, going from data to woven sculpture? There are two parts to my process: data collection, and the sculptural or musical translation of data. The first part, data collection, takes place in various forms. If I am looking at a specific environment, I build very low-tech data-collecting devices that collect information on a daily basis. I record both the numbers the devices are measuring as well as daily observations of things the instrument does not register. My own observations and recordings are then compared to sites on the Internet that record similar data nearby. Everything gets collected on clipboards, which end up having tons and tons of charts and numbers and Excel sheets on them. From the many variables I have collected, I will choose two or three to begin the initial translation process. Sometimes I go directly into a sculptural translation. But lately, I have started the translation process by first creating a musical score built by the data I am translating. Since I neither play nor read music, the score looks very nontraditional and functions foremost as a kind of “architectural blueprint” for my sculptures. Basket weaving is my main sculptural medium because it provides me with a simple yet effective three-dimensional grid through which to translate data. The sculpture becomes collaboration between the material, the numbers, and myself. The material I use to translate is reed, which has an inherent tension that does not allow me to completely control it. If I push it too hard, it will simply break. My lack of control ensures that the numbers have as much of a say in creating the form as I do. It is the changing nature of the numbers over time as well as the inherent tension of the reed that create the shape of the sculpture. Only in certain instances do I step in and exert pressure when I sense the piece physically falling apart. I never know what the shape will be beforehand, which often leaves me scratching my head, as some shapes are easier to work with than others. "To Hear an Ocean in a Whisper" (2013). 7’x7’x6’. Data, wood, reed, rope, paper. Image courtesy of the artist. To Hear an Ocean in a Whisper explores biological, meteorological, and physical processes that are the foundation of the rich marine life and diversity found at Georges Bank in the Gulf of Maine. This is a collaborative project with Jonathan Fincke, that is part of the Synergy Program, an experiment in art/science communication, in which visual artists have been paired with ocean scientists from Massachusetts Institute of Technology and the Woods Hole Oceanographic Institution to render complex scientific concepts accessible to the public through art. Jonathan Fincke is an acoustic engineer and oceanographer who uses sound to study the biological processes in the water column of Georges Banks. The show is currently at the Museum of Science in Boston. SciArt: Your work is wild in color, form, and texture - how did you come to work in the materials that you do? NM: I think a lot about play as a process of thinking something through and as a visceral, tactile language of moving between disciplinary boundaries. A question articulated through science begins with a very different premise - confined by its own language, expectations and rules - than if I address that same question within the context of art. Like an opportunistic leech, I take from both disciplines what I deem as essential in helping me explore what I am curious about. Play allows me to circumvent these boundaries by viewing my sculptures as three-dimensional thoughts in space rather than physical objects. We do some of the most creative learning when we play - when we approach something with no particular outcome in mind, but are open to engage with whatever is being presented to us. The work is light and fun, but only on a surface level. 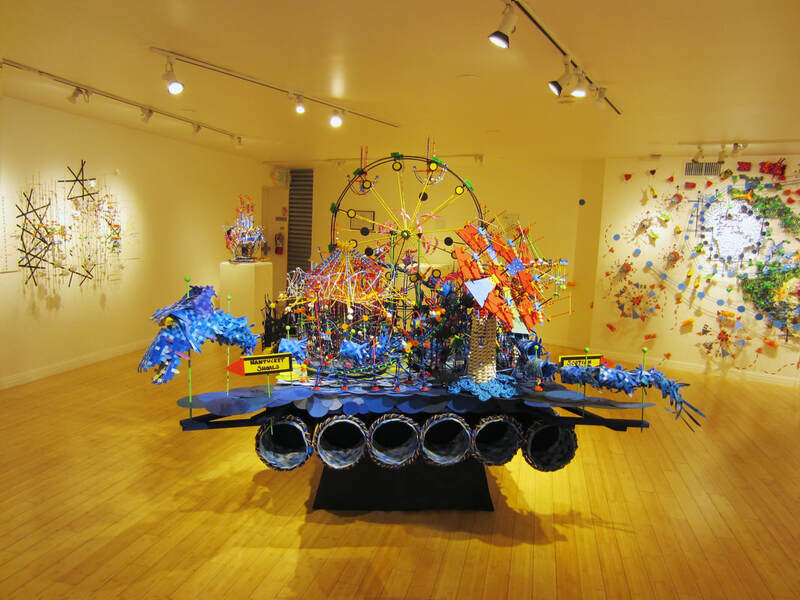 Your first reaction when you see the work is, “Oh, this looks like my construction toy set when I was eight,” but as soon as you recognize the numerical logic that underpins this chaotic playfulness, I think a deeper tone enters the interpretation. This is when I think the work becomes theatrical and even absurd at times. When you look at it in the context of what the work is addressing - climate change and weather - the playfulness becomes a commentary of a different sort. Absurd is how I would describe how we’ve been dealing with the whole debate on climate change. We play with statistics and graphs to prove or disprove the inevitable reality that this planet is changing and yet we’re doing very little about it. It’s politically more convenient to focus on wars, education, and a recession, when all along this time bomb is ticking away. We are playing with weather in the way we choose to understand how it’s changing and interacting in the environment. Sometimes I feel like we are characters in a Samuel Beckett play, waiting for Godot to finally make us realize that waiting and waiting does not wish away this changing reality. 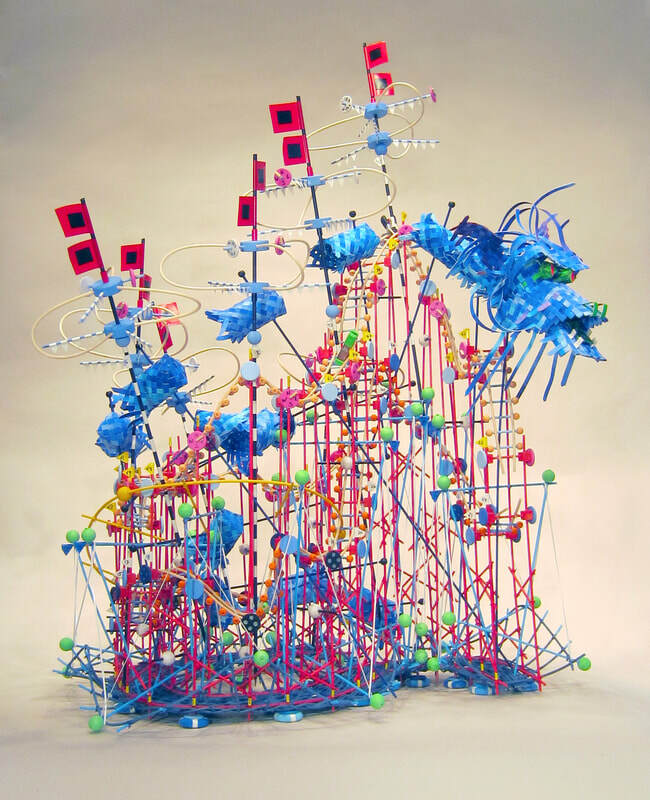 of sculptures that were inspired by the Hurricane Sandy. The most enduring images of Hurricane Sandy for me were the photographs of the Star Jet roller coaster from Seaside Heights, New Jersey washed away from its pier mooring and the eerie, desolate and damaged area of the Coney Island amusement rides. These wrecks, as seen from the shore, became an ominous and emblematic image of our own inability to really confront the changing environmental conditions that climate change is bringing about. I was stunned to hear that the owners of the amusement park Fun Pier, where the Star Jet roller coaster was, were not only rebuilding the park but adding a ride called “Sandy" that was to mimic the conditions of a Hurricane. Somehow, I thought, a horrific storm like this would have led to some re-evaluation of how the shoreline should be zoned. Instead, we ignore what happened and rebuild as if Sandy were just an annoying exception. "The Last Ride" (2012). 38"x31"x26". Reed, wood, data. Image courtesy of the artist. This piece translates weather and ocean data from Oct 29-30, when Hurricane Sandy took the last ride on the Star Jet roller coaster. SciArt: How much of the science behind your work do you want your viewers to walk away with? it framed as being made up of science data. A simple legend nearby tells viewers what all these different colored beads mean: red beads stand for temperature, green dowels stand for barometric pressure, etc. Armed with these additional clues, the viewer becomes a kind of detective, trying to piece together the meteorological event the piece is about. However, the pieces rarely read as didactic as the legends seem to imply, but are closer to a visualization of the larger complex structure that holds all these variables together. SciArt: In addition to translating data into sculptural forms, you are currently collaborating with composers to translate scientific data into music. Can you talk about the process of this project, and how you think music can function as a communicator of science? NM: The latest development of my work includes the translation of meteorological data into musical scores that also function as weather almanacs and blueprints for sculptures. The data I use is a combination of my own collected observations and data available from local weather stations, offshore buoys, and satellites that is available from the Internet. These objective weather readings such as barometric pressure, temperature, and wind are combined with notations of specific human experiences - both my own and those of others. The integration of both leads to a musical/sculptural translation that explores how human emotions and experiences influence the perception of weather. in building the score to produce a specific sound, because I don’t want to impose any kind of preconceived notion of what it should sound like on the visual creation of the score. I want the data to reveal itself sonically through the behaviors it creates with other data nearby. To me as a sculptor, the scores don’t function sonically at all. Rather, a score represents a kind of sculptural shorthand that I can use to begin the three-dimensional translation process with. These musical scores are translated into sculptures and are used in collaborative performances with musicians. These sculptures not only map meteorological conditions of a specific time and place, but also function as three-dimensional musical scores to be played by musicians. While musicians have freedom to interpret some parts of the score, they are asked not to change the essential relationship of the notes to ensure that what is heard is indeed the meteorological relationship of weather data. My aim is twofold: to convey a nuance or level of emotionality surrounding my research that thus far has been absent from my visual work, and to reveal patterns in the data musicians might identify which I have failed to see. Musical notation started to enter my translation of weather data into sculpture, in part, when I became aware of nuances that are embedded in numerical behaviors that meteorological instruments don’t pick up, but the human mind does. In that lies an imperfection/perfection of the human mind that I find incredibly fascinating and beautiful. After working with meteorological data for several years now, I began to notice how I was relying on and beginning to trust my own observations more than data readings from my own weather instruments. These observations, often done peripherally out of the corner of my eye, were often not picked up by my weather instruments, but began to influence the way I was interpret- ing the data I was collecting. I am also becoming more interested in how humans perceive weather as opposed to how scientific instruments record it. Musical notation is a vehicle that allows me to integrate and find new sculptural solutions to that little glimmer of nuance and emotion that is creeping into my weather observations.